Certainly, Comey did some truly inept things leading up to the November election, and yes, sure, there were things he could have mentioned WAY BACK in July 2016 that might have made a difference in the outcome. We have already heard from Comey himself that he’s nauseous (though that ought to be nauseated, like I am) whenever he thinks about what happened as a result of his claims. The very first thing out of people’s mouths, at least the ones who’ve got a paid public platform and who care about what’s going on in the White House, seems to be a parallel drawn between Trump and Nixon, who fired Archibald Cox in the middle of his Watergate investigation. And yeah, sure, there are some undeniable parallels to be drawn, though it took the better part of six years for Nixon to get to where Trump is today, barely three months into a four-year administration. I’ll grant you the parallels are kind of obvious, but they’re not what I’m seeing. Given what I’ve already observed (see Related Articles below), it’s already too late. Trump’s exercised his authority via trial balloon and there aren’t enough politicians with the guts to stop him. You watch. Today’s revelation, just at the end of the business day, that Trump handed over actual classified material to the Russians who visited the White House the same day, who took photos when Trump excluded the US press, who have already been identified as inconvenient connections to Flynn and Kushner, will go nowhere. In fact, Fox News is already reporting that this is fake news, and that the real story is that we’re close to pushing for a Convention of the States. Notice the red? 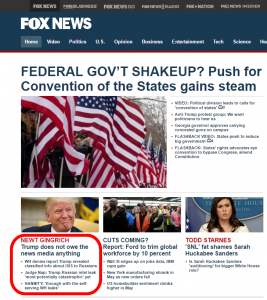 That’s what FoxNews thinks is important about the story. We’ll come back to this in a bit. While the Nazi regime cracked down on the local and international press in 1933, The Associated Press was able to report in Germany until the United States entered the war in late 1941. That access did not come without condition or compromise. It’s ironic, the timing of this story, given Trump’s present attitude toward Russia. Combined with Comey’s firing out of what on first blush looks like the clear blue sky, it becomes really easy to draw connections between Germany in 1933 and the United States in 2017. Too many people are flinging around the term “Reichstag Fire” and wondering when we’re going to have our own version here in the US. The Reichstag Fire remains an acknowledged starting point for Germany’s worst totalitarian regime (and I use this definition judiciously). To be sure, there are actual Nazis marching in the US, most recently (and visibly) in Charlottesville, VA. I contend that we either got there a long time ago, with the response to 9/11 (not a conspiracy theory – I believe the Bush administration took advantage of an independent terrorist attack, but there’s no conclusive proof that they colluded in its planning), or that we’re not going to have one because it’s unnecessary. The GOP have already taken over the government and they’re just waiting to complete the process in the 2018 election by using voter suppression to eliminate the remains of the liberal Democratic safeguards in the House and Senate. It’s not the Reichstag Fire in itself that led to the Holocaust, but it was certainly a catalyst. Cynics like me are watching for our own version, but we’re still not there, though we just took a huge step closer when Trump fired Comey. The Nazis used the word Gleichschaltung for the process of successively establishing a system of totalitarian control and coordination over all aspects of society. It has been variously “translated” as Nazification of state and society, synchronization, bringing into line, and co-ordination, but the German word is often left as a cultural term in English texts. Forget about the oblique references to Nixon’s downfall. We aren’t talking about Watergate here, no matter how much we might want to. The GOP in our current Congress will never impeach Trump, and they will do ANYTHING to consolidate that power to ensure that it won’t ever slip out of their fingers again. The Russians have too much on each of them. The whole rotten bunch is implicated and they all know it. We got where we are today because OUR press was complicit in aiding and abetting Trump. Celebrating his oddness, his theoretical illness. Suggestions of dementia, unfitness for office, or any number of illustrations of authoritarian dictatorship aside, the GOP is happy to have Trump where he is, as a distraction while they dismantle the social safety net and return us to the Gilded Age, long before unions, weekends, health insurance, and pensions. And what’s funny here, what people just don’t get because they can’t be bothered to crack open a book and read, is just how dangerously close we are hovering to the edge of that fascist cliff. Senator Mitch McConnell has already declared the need for an independent investigation as dead on arrival. It’s not necessary, he claims, because the FBI is already investigating, and why on Earth would we want to interfere with that? Just because the head of the investigating agency could have guided his staff to seek out conclusive evidence of collusion? Because he’s implicated by said evidence? Because his job is too cushy and his corporate masters have him by the legislative balls? The FCC is preparing to erase the gains of Net Neutrality. It’s likely that our access to the internet, to our cellphones, to each other across the country and across the oceans, will be impeded within a matter of months. At the same time, Senators are developing their own version of TrumpCare, which won’t be any better than the House version that passed last week. Certainly, unless we find some way to change course, not only will we lose the ability to communicate freely with one another, but we will have to trust the media for providing us with truth and not kompromat. And will any of this matter if the Constitution goes away entirely? I think you can figure out my response.